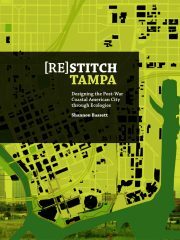 (Re)stitch Tampa, an international design ideas competition, challenged designers to consider innovative design ideas and strategies, employing connective urban landscapes and ecological infrastructure as an underlying framework for the post-war coastal city. 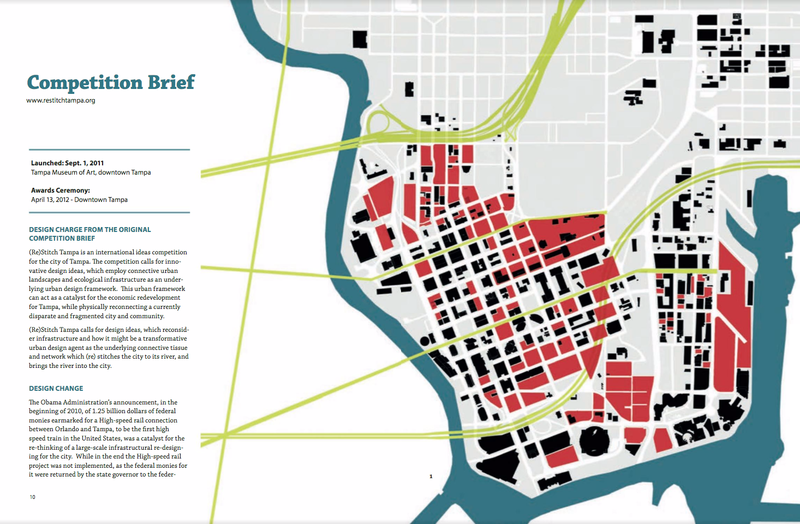 The competition brief posited that this framework might operate as a catalyst for the economic redevelopment, as well as the landscape and urban recovery of Tampa, Florida. 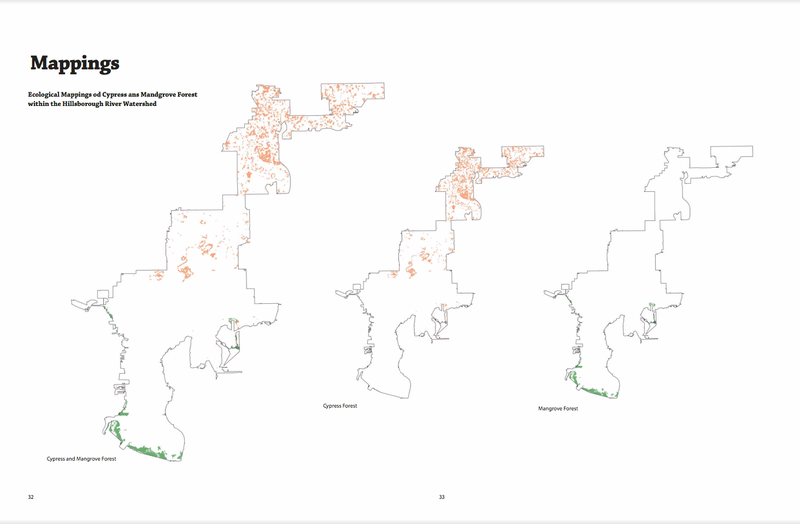 These strategies might physically reconnect a fragmented city, its urban fabric punctured with urban vacancies and significantly impacted by foreclosures during the financial crash, as well as earlier suburban expansion and urban renewal agendas. 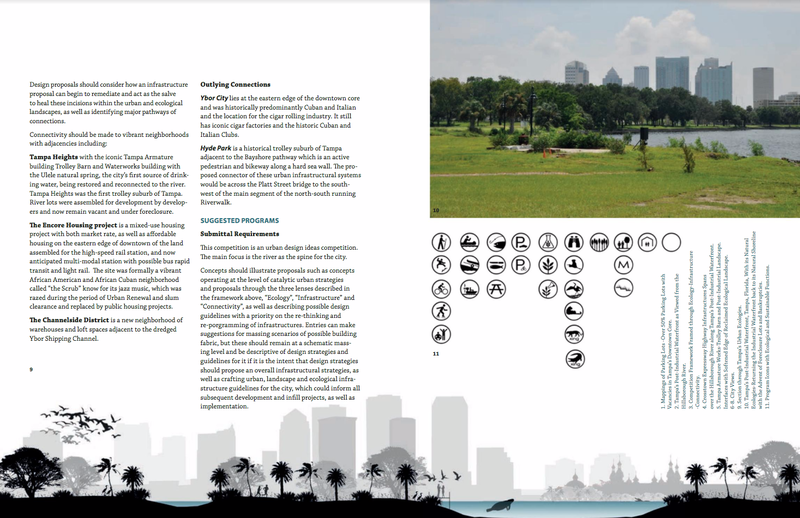 The Obama administration’s announcement in 2010 of 1.25 billion dollars of federal stimulus package monies earmarked for a high-speed rail connection between Orlando and Tampa, to be the first in the United States, was the initial catalyst for the large scale infrastructural re-thinking of the city. While the high-speed rail was not implemented in the end, squashed by tea party politics, this infrastructural initiative still prompted the momentum and enthusiasm for an infrastructural re-thinking of the city. 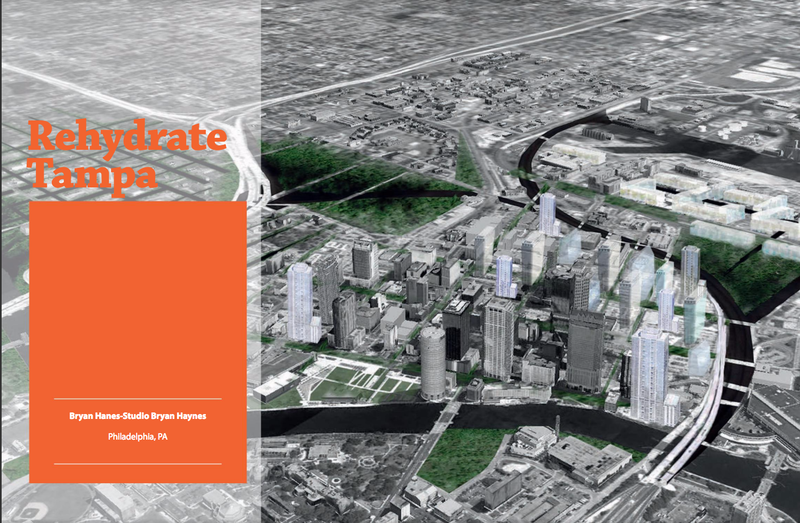 How might this new urban framework begin to choreograph the flows and movements through the city, to and from its river running through Tampa, virtually hidden and undetected? 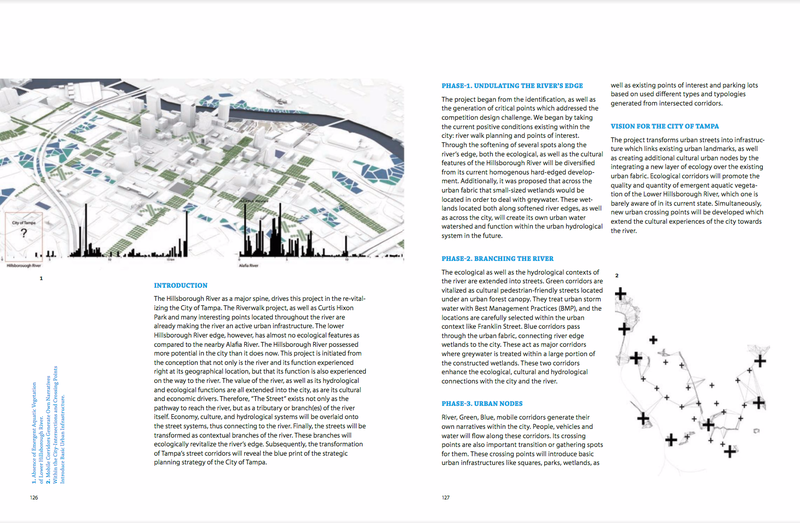 The charge of an urban design master plan, initially focused around what was designated as the high-speed rail station, was the impetus for the re-thinking and recalibration of infrastructure through ecologies for the city. This publication critically examines these issues through essays, in addition to showcasing selected competition entries, the results of (re)stitch Tampa. 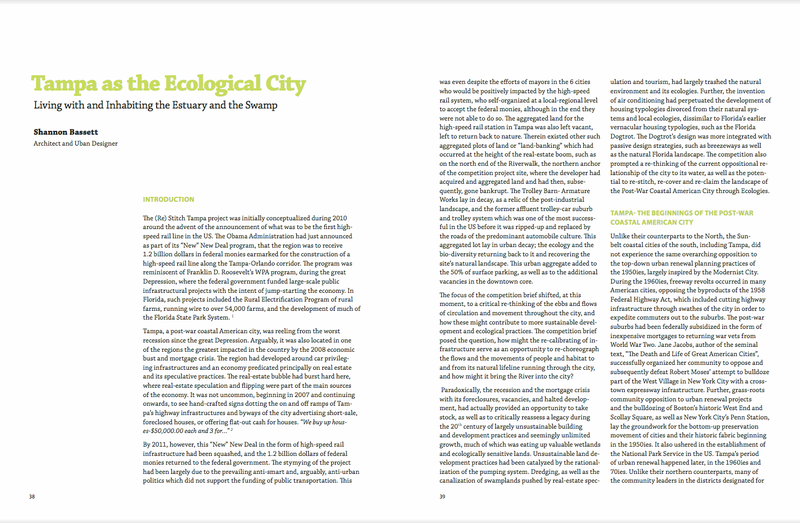 The discourse distills the design schemes and examines their possibilities as viable alternative urban models for development, which reconsider the relationship of landscape to the city and urban redevelopment. 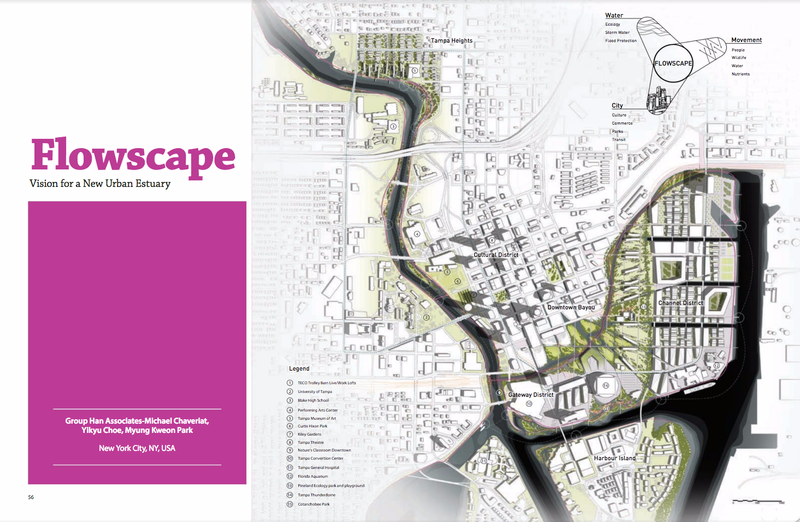 It also proposes how the schemes might operate as transformative urban design agents and as the underlying connective tissue which (re)stitch the city to the river and bring the river and its ecologies into the city. Size: 20.3 x 26.5 cm. 8 x 10.45 in.